I will come out and admit right up front that I am no longer much of a fan of The Food Network. Where it used to be the default destination on my cable remote, I now feel that I’ve mostly outgrown their rapidly declining programming. At most I’ll turn on Iron Chef America (which has also gone downhill somewhat but which I still enjoy a great deal) Good Eats (if I can ever manage to catch it), or Diners, Drive-Ins and Dives (don’t judge, I love me some triple-D). The cooking shows have, as a general rule, fallen off. However, it was through The Food Network that I was first introduced to Bobby Flay and his intensely-seasoned, chile-laden southwestern style of cooking. I know many people take issue with Chef Flay due to his somewhat arrogant bearing on tv and his apparent inability to cook anything well that doesn’t match up with his usual M.O. And I can understand why those people feel that way – he annoyed me for a long time too, and I was unimpressed by the casual way in which he tossed around chipotle peppers and his single-minded devotion to all things grilled. I was annoyed, until I tasted his food for the first time. All it took was one meal at Mesa Grill New York and I was a fan for life. Say what you will about Chef Flay; the man knows how to put flavors and ingredients together to create a dish that’ll make your tastebuds sing. Sure he’s a one-trick pony, but that’s a-ok with me because he does what he does so damn well. Whenever I’m in the mood for something southwestern or vaguely tex-mex, but more interesting than your typical taco or fajita, I pull the Mesa Grill Cookbook off the shelf and flip through, certain that I’ll find something that will not only inspire me and make a damn good dinner, but will find its way into my bag of tricks for later meals. This meal is pretty much the perfect illustration of that statement. 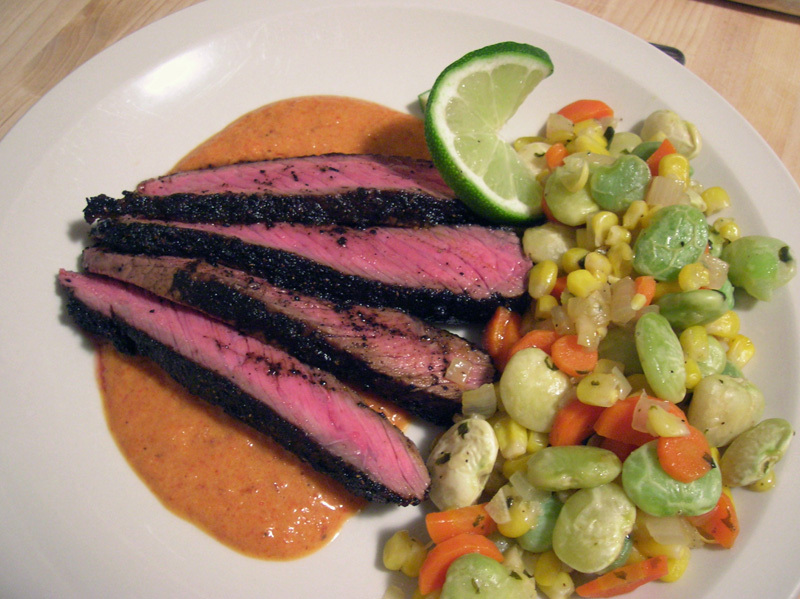 The coffee and chili rub on the london broil and the smoky red pepper sauce are both recipes from the book which are signature Bobby Flay creations and which have now become staples of our cooking repertoire. The coffee rub is my absolute favorite rub for beef, hands down – it’s smokey, spicy, fragrant and a bit bitter, and plays off the deep, earthy flavor of beef perfectly. The pepper sauce does, in fact, make use of the much-maligned chipotle, but the real flavor base of the sauce is sweet, roasted red bell peppers. We even cut back on the amount of chipotle called for, so that the smoke and spice become subtle background notes to the tangy sweetness of the peppers. Its a remarkably versatile sauce, and we find ourselves using it in all sorts of dishes when we’ve got a batch in the fridge. The succotash side dish is also based on a recipe in the Mesa Grill cookbook – its not exact, as the original called for chayote squash which we don’t have access to. If you like lima beans, though (and I do) its pretty hard to beat the combo of sweet corn and carrots, limas, onions, lime juice and cilantro. I’ve never actually eaten chayote before so I don’t really know what we were missing without that key ingredient, but I’d say the sweet, fresh-tasting succotash was a pretty perfect complement to the richly flavored beef. I love how colorful this plate is (which is another thing that Bobby Flay does really well, by the way). Recipes for the rub and the pepper sauce are below, and I hope you’ll try them out the next time you want something a little different for your steak dinner. If you like them, take a peek at the Mesa Grill Cook Book, borrow a copy from your local library and try another recipe or two, and see if it doesn’t make you feel just a little bit more charitable about Bobby Flay and his chile-loving ways. Makes about 1 cup of rub. There aren’t any, really – just mix everything together in a bowl. Ta da! 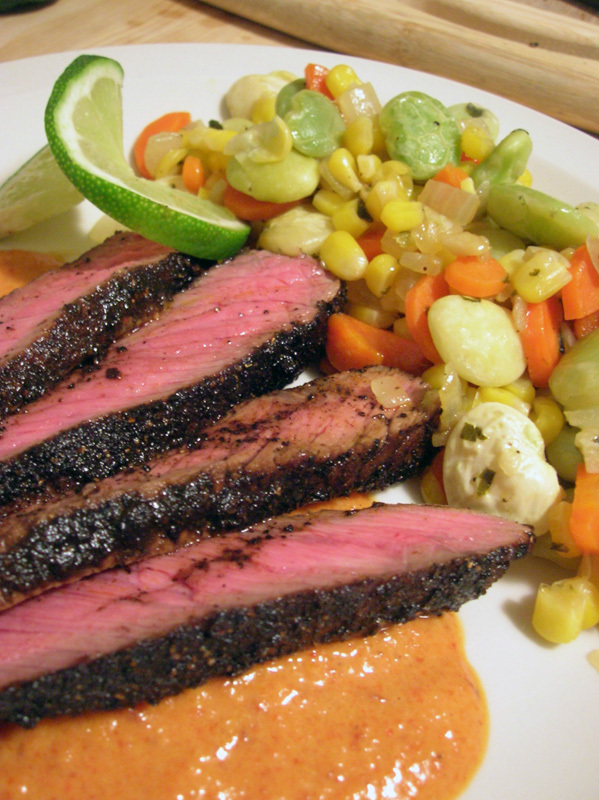 Use like any other spice rub on your preferred cut of steak, or even on a beef roast. (Haven’t tried it yet, but now that I’ve thought of it, its gonna happen.) To make our london broil, we just rubbed a couple tablespoons into both sides of the steak and seared it in a bit of oil in a VERY hot cast iron pan, then let it rest for 5 minutes before slicing. Remember that with steak, you want the meat at room temperature before cooking so that it will cook evenly and yield that beautiful red center beneath a crisp outer crust. Regarding the coffee beans: Much like cooking with wine, you want to use a flavorful product that you’d actually enjoy brewing and drinking. The flavor of the coffee will be intensified when its cooked into the steak, so don’t try to use something like Folgers on this – spring for the good stuff. For an even more intense flavor, start with whole spices, then toast and grind them fresh. Its more work, but its worth it. Try replacing some or all of the sweet paprika with a smoked variety – smoke and coffee play VERY well together, and good smoked paprika will also have a special sort of earthiness that will complement the flavor of the ancho chile quite nicely. I skip the chile de arbol/cayenne because I’m a wuss, but feel free to add as much or as little as you like. This recipe will make more than enough rub to coat steaks for dinner for 4. Store the extra in the fridge in a container with a tight-fitting lid and it’ll last for weeks. Again, this is easy as pie: just toss everything except the oil in a blender and flip the switch. Once you have a smooth puree, drizzle in the oil while the motor is running and blend just long enough to mix everything together nicely. (Don’t overblend when you add the oil – EVOO releases bitter flavor compounds when its agitated too much.) At this point you can go ahead and use the sauce as is; for a more refined, more smoothly-textured sauce, pour through a fine mesh strainer into a clean bowl, using a spoon or spatula to help push the puree through if necessary. Serve with your coffee-rubbed steak, or use as a dip for crudite, as a sandwich spread or burger topping, as a mix-in for salad dressings (either vinaigrettes or creamy mayo-based dressings), in pasta dishes, on pizza, or just as a vibrant, flavorful garnish on any dish with a spicy, southwestern flair. This entry was posted in Food, Drinks and Cooking and tagged beef, coffee, dinners, meat, recipes, sauces, southwestern, spices, vegetables. Bookmark the permalink. I adore Bobby Flay. Really I do. As you stated, yes he basically just does American fare but he does it well. He knows what he’s good at and sticks to it. Too often I see good chefs flounder and fail because they think they can do everything. Also, watching him struggle to bake any sort of confection amuses me to know end.